CLIFF NOTES: the most important pattern in the history of the US stock market was hit today. Period. that low when used as the key node for retracements was responsible for the LOW in 1987 (.382 retracement ), the LOW in 2003 (EXACT 50 percent retracement) and the LOW in 2009 (EXACT .618 retracement). it was also the beginning of the projection for the high in 2007.
now, currently, the 1896-2007 leg is projection to an area EXACTLY to where we close today …additionally a 1.618 extension from the 2007 top is at the exact same area. folks, I incorrectly assumed that a top had been made in the transports when we went down 4% in one day. figured some slippage or something like that. well, it kept going up and, guess what — it went up and smacked (today) the ONLY PATTERN that can be complete using the all time low. one last – these numbers we are dealing w/ have their genesis from the all time low in the Dow Jones Transports some 42887 days ago. what does that mean? well, it’s a big flipping pattern that completed today is what it means…you can argue if it takes into account inflation or stock splits or any of that other stuff … none of that matters. Look at the chart and there right in front of you is the retracements and projections. 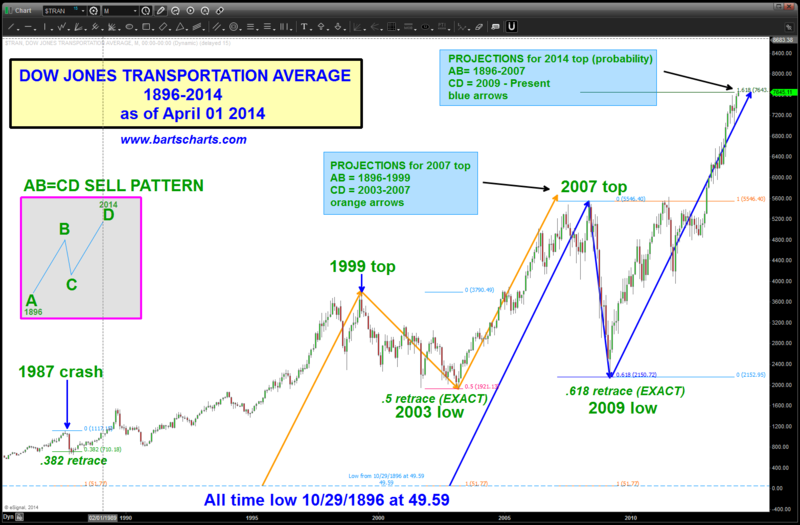 How did you get the low of Dow transport was 49.59 in 1896? Based on Yahoo, the Dow Transport was 13.23 in July 11 1932 (weekly). This alone nullified your bottom value. Anthony, thanks for the follow up. I have been watching the formation of this pattern for a while and when I came up w/ that low it had something to do w/ the transports actually being formed before the industrials. I will find the link for you. July 11 is my birthday, I found that funny. So, if we allow for 400 points (the basic difference between our two lows) then the macro AB=CD pattern is even closer. (I just added 40 to the desired target) Also, the 2007-2008 high is done on the chart and not the actual data (I drew it). So, some slippage/point count could be off by a bit …either way, the pattern is complete/completing and should mark stiff resistance. Or not …that’s the beauty of the patterns as they either work or they don’t! Make sense and thanks! One other issue i have is, isnt AB time supposed to be pretty equal to CD time? Seems odd that an 11,000% increase in price over 110 years could be “harmonic” with a 200% gain over a five year period. Jared — first off, it can do whatever it wants. It’s ideal to have price and time equal. if we take a look at the NAZZIE we find AB=CD in time but 1.732 AB=CD in price. not a perfect AB=CD but it is smacking into the .786 and the LOG trend line from the all time low … Transports are hitting a pattern. It will work or it won’t.